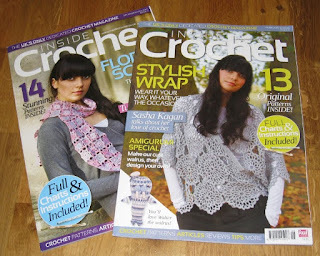 As I'm running a little behind in reviews at the moment I thought I would treat you to the last two issues of my favourite crochet magazine - enjoy! My first flick through this issue was a bit of a disappointment as there were no patterns this time that jumped out at me and demanded to be made. There are a couple of interesting tops that use some unusual crochet effects - but as they didn't appeal to me I skipped quickly past them. The strange (similar to one worn by Cheryl Cole when performing "Fight for this Love") red Waterloo jacket was also not my style. That with some other unappealing miscellaneous crochet bits n bobs it was all a bit disappointing. There was however a cute little pattern for some white mice which is a real improvement on some of the previous issues attempts at crochet toy patterns. This one pattern and the interview for the latest Nicki Trench book (Super-cute crochet creations) were the best bits in a sadly lacking issue. For some reason I enjoyed reading through this latest issue much more than the previous one. The articles within it this time were all good and covered a range of topics that appealed to me. There was a great piece on using up your yarn stash with some really good ideas for small projects that were suited to odds and ends of yarn that most crocheters of any length of time will have plenty of. I also enjoyed the article about recycled yarn, which had all kinds of ideas of different materials you could have a try crocheting with. The patterns seemed to be much better this week, I really loved the lion and bear kids hats by Jane Bibby, the pretty swing coat for a little girl by Tina Barrett and the lovely floating wrap by Robyn Chachula. There is also much more about Amigurumi in this week with an indepth look at designing your own as well as a rather strange pattern for 'Walter the walrus' which didn't appeal to me but is a hopeful sign that there will be further amigurumi patterns in up coming issues.